"Originals" is a multi-media, multi-genre, muli-cultural event designed to serve the local suburban community which is typically underserved in the area of the arts. 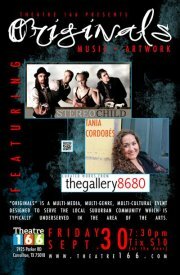 This event combines the talents of three original singer songwriters with the artists of the Gallery 8680 and the new, non-profit community HD venue, Theatre 166 to provide a multi-sensory experience. The evening will consist of an installation of a curated show by the amazing local artists of the Gallery 8680 and a concert by three local original singer-songwriters of different genres. The art show will occur in the gallery hall outside of the listening room. The concert will take place in an amazing "Austin City Limits" style listening room presenting Peter Bixby in a short singer/songwriter style set, Tania Cordobés with a special ensemble including some of the areas finest professional latin music specialists ( Carlos 'Fifo' Rengifo, Jorge Ginorio, Jose Aponte, Yoban Quijano) performing her original contemporary Latin fusion songs, and a set by Christian Ross, Peter Bixby and Lisa Clough-Lachri who represent the band "Stereo Child" performing their original songs. The listening room has 124 seats available, so seats are limited. Our goal is to raise enough money so that the entire event is free to the community. With your help, in a few weeks the seats will be free and all we will have to do is take reservations. This is our first Kickstarter effort so we are asking for a modest amount and any excess will be used to complete the funding of the project (i.e. we asked for less than we need). You can pledge a modest amount, buy a seat for someone else or yourself in advance, or make a great pledge! Your contribution in any amount will be most helpful and you can see the pledge awards are original and amazing! Thank you! !